As the clock struck 7:30 p.m. on Tuesday night, the pre-show chatter in the Chan Centre was hushed by a slow swell of strings, heard tuning in unison from backstage. 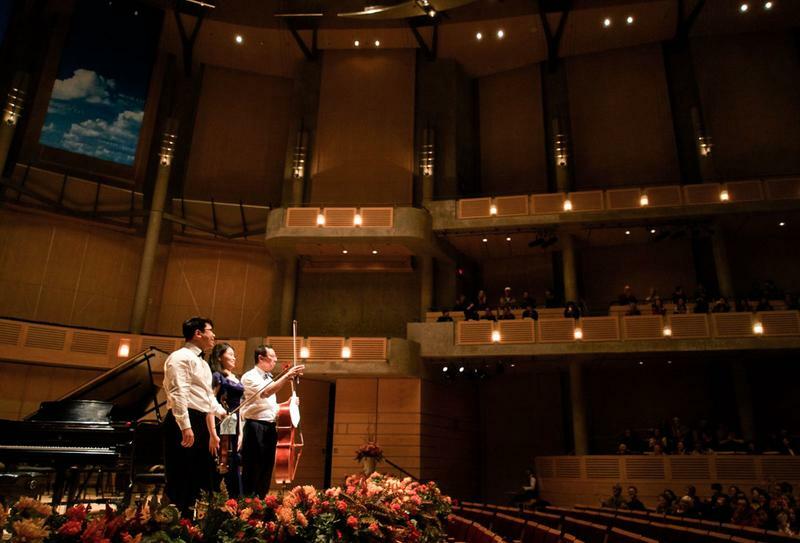 UBC alumni, students, visiting dignitaries and classical music enthusiasts trickled into the concert hall, and took their seats to an excited hum. Commemorating the installation of Professor Santa J. Ono as UBC’s 15th president and vice-chancellor, those in attendance braved the downpour and howling winds to hear the best and brightest of the school of music — and probably, at least in part, to hear Ono play the cello. The UBC Symphonic Wind Ensemble Brass opened the night with a rousing performance of Richard Strauss’ “Vienna Philharmonic Fanfare,” lifting spirits to the high, light-speckled ceiling of the Chan. Master of ceremonies Nancy Hermiston — chair of the school of music’s voice and opera divisions and university marshal — elaborated on the program choice in her opening statements, saying that the tone of the first piece reflected how happy the university is about having Ono as president. Hermiston was an ideal host for the night, making self-deprecating jokes about her mathematics skills — or lack thereof — and discussing Verdi with equal ease. Early in the program, President Ono performed a Mendelssohn trio with violinist Edmund Chung and pianist Irene Margarete Setiawan, both of whom are students at the school of music. “Piano Trio No. 1 in D Minor, Op. 49” had remarkable emotional and technical range, cycling through soaring joy and heart-rending despair in the space of 10 minutes. The urgency and emotion of the cello part showcased the instrument's power and inspired an immense depth of feeling in the listener. Under the direction of Hermiston, the UBC Opera Ensemble performed excerpts from Rigoletto and Candide, and while the dancing was best seen through splayed fingers, the vocal performances were ultimately a joy to watch. The UBC Symphony Orchestra rounded out the night with performances from Brahms’ Symphony No. 2 in D Major and Antonín Dvořák’s Carnival Overture. These pieces proved to be highlights of the night and the only ones to be viewed by Santa Ono from the audience, as he was spotted sneaking amongst the front rows just as the orchestra took the stage. The energy of Dvořák’s piece was infectious — nodding along to the first strains of the triumphant overture with its bold, staccato brass jabs, a woman in the next row hit her thigh in time to the thundering cymbals. She wouldn’t have looked out of place in a mosh pit, nearly head-banging in her excitement for the first movement — a first among my symphony-going experiences, and likely for many sitting in the vicinity. Henderson closed the concert with well-wishes for the new president and they shared a cute wave of acknowledgment from stage to audience. The night closed as it began — optimistic, swelling and ringing with the promise of what may come from this presidency.